What’s that you say? Halloween was a week ago? So it was! But I had a sick child, an eternal doctor’s visit, and a small assortment of other hassles last week that intervened with this writing, so you get it today! The costumes were Eliot’s idea. We had to herd him into committing, though, as he was inclined to invent about a hundred other costume ideas between mid-September and Halloween. I liked this, though, because I felt they would be fairly easy to sew (unlike last year’s Buzz Lightyear), and although Angry Birds are very popular, I didn’t think they would be super prevalent on the darkened streets. I used Simplicity 2070, a toddler chick or pumpkin costume pattern, which I thought would be easy to alter to a bird situation. Red and blue fleece, and I didn’t make legs, because the angry birds don’t seem to have legs, and I didn’t need additional work. The pattern was ridiculously easy, both to cut and to assemble. I probably spent about five hours total on both costumes, plus an additional hour reminding Eliot that he didn’t get to change his mind once I’d purchased the materials to make his initial choice. They both seem to really like their costumes and they were adorable, in my personal opinion. Half of the houses we visited knew what they were, and the rest thought that they had something to do with Phineas and Ferb: something about a platypus? I read a blog post yesterday where the author talked about how slightly jealous but mostly sorry she felt for the perfect women who surrounded her at the school pick-up, how much more tyrannical and less joyful their lives must be because they are so polished seeming. As I read this, I felt a little up in arms. I’m hardly a picture of suburban pressed perfection, but I’m a pretty together person. I wear a bra and shave my legs; I generally try to brush everyone’s hair, including my own. I like to wear clean clothes. My house is super super neat and tidy. But I don’t participate in grooming activities because I feel pressure to appear perfect, I do it because I don’t LIKE the breeze blowing through the tiny hairs above my lip. I shave my legs because cotton sheets feel like silk on smooth legs. I brush my children’s hair because it gets tangly and I’m not sure that tangled hair and food on one’s mouth is the best way to present to the world. And maybe that’s a presentation issue, but you know? At nearly-four and six? They need to learn how to care for themselves, so they can then choose to reject or embrace hair-brushing at 18 or 24 or 40. My writing group has talked about this too: more in the context of how we present ourselves as authors. Do we get less honest because we are concerned about appearances? Is that manifested in our daily lives through guilt over dusty houses or a concern that people won’t like us if we are not wearing posh shoes? I’ve taken feminist lit classes and women’s studies courses. I’ve heard all about the cult of domesticity, the pressure on women to do it all. I’ve read mommy blogs, articles about mommy wars, and stories on mothers vs. non-mothers. I understand patriarchal oppression and colonialization. What I do not understand is the assumption that the appearance of perfection is predicated on artifice. That people who have clean houses and relatively tidy children are somehow less authentically themselves that women whose children are unkempt in the late afternoon or who don’t have razor-cut layers or wear flip-flops. I’m by no means perfect. I feel like I have zero ability to dress myself, although thanks to friends and magazines and so forth, I am getting to a place where I get dressed and feel happy with how I look in an outfit, comfortable that I am representing my soul and flattering my figure. I don’t think it’s oppression to play up one’s better features, nor is it artificial of me to want to wear things that I feel comfortable in. If you like wearing sweatpants, then so be it. But don’t assume I’m less myself because my shirt & skirt match. My house is unbearably tidy to some, and ridiculously clean to others. That’s how both Husband and I like it. We like being neat. We feel oppressed by clutter; it makes breathing harder for both of us. I feel like I can’t work surrounded by stacks. I need to organize, to catalog, to create checkboxes and lists. I like it that way. The children are expected to clear away their toys, most days, because I think that, again, learning to care for your belongings is the pathway to rejecting that. Or deciding that you are okay with stacks. But in my house? We tidy. We brush our hair. We brush our teeth. We get dressed sometimes, and other times we don’t. We remain ourselves: boisterous, argumentative, chatty, catty, lushy, crafty, writerly, and orderly. Poor Eliot. I think we wrapped things up on an okay note, if the squeeze he gave my neck is any indication. Minutes earlier, though, bedtime looked more like wartime. It was my fault. I take full responsibility. I’ve already apologized, and he’s already forgiven me. Fortunately. And it really was my fault. My throat hurts. I’m very tired. 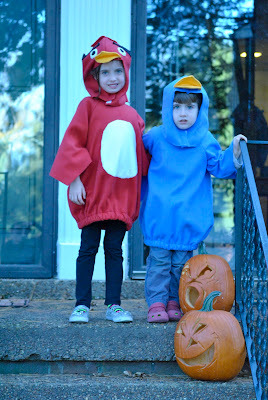 I just wanted to tuck everyone in and carry on with my evening, which HAS to include the completion of at least one Angry Bird costume, if not both of them. So, we finished our story-reading (Birdie already made because I told her I was reading the book she wanted to read), and I flipped off the light in the middle of Eliot reeling off the colors on the cover of the same book. Maybe I should blame Dr. Suess and his book, right? But, really, credit is all me. I turned off the light, turned on the cd, and took the book. Eliot was mad, and fairly, but then he punched me as we all snuggled in Bird’s bed. And we don’t do punching. Five seconds later, the polar bear punched me. “Using a tool to do your hitting is still hitting. Go.” I unceremoniously dumped him in his bed, returned to Birdie, snuggled her for the two songs we snuggle, and went back to his room, where his sorrow remained in full force. I told him how sorry I was, how I knew I was wrong. No. Apparently, everyone in the entire world does what Eliot wants. Except me. I lost count the other day, as he hollered at me from the back seat, but I’m pretty sure he prefaced “mad” with thirty “very”s. That’s pretty mad. I’m not sure how we’ll find our way out of this not getting your way means people (ME) are mean phase, but I’m sure it will come along eventually. In the meantime, I’ll keep apologizing when I am actually officially wrong. And I’ll keep hugging a teary boy. I am so excited about both of my October sewing projects. The first is a tiered twirl dress for Bird, loosely based on a particular Matilda Jane dress from several years ago that looked so deliciously twirly and gathered. I found a pattern from Kustom Kids Boutique, the Nini dress, which I don’t see in their shop. I love PDF patterns, because typically they show up in my email box minutes after I buy them, satisfying my desire for instant gratification even if I don’t start on them right away. The pattern was very easy to follow. My only trouble came in gathering my tiers. I sewed all around the bottom tier twice, as instructed, with loose gathering threads. Sat to gather, and the thread broke. And I did this again, with the same results. Mind you, that I’m working with something like 14 1/2 feet of fabric in one tier alone. Everything had come along so easily, including using an overlock stitch feature on my still quite new-to-me machine, that I felt really frustrated. Finally, I dug out some heavier thread, which worked swimmingly. I also have to credit the shop owner, who answered my woeful email with a couple of helpful tips and just the right amount of sympathy. On the dress, I still have to cover the buttons and stitch them on the straps, then hem it, but otherwise, nearly finished. I can see making another one, but it won’t be anytime soon! Pics will be up when it’s all complete. We came to the end of an era today. I try to use my dusting time as purging time as well: usually, I’m just collecting waywards papers and shoes or the bits and bobs of child detritus (how many rubber bands can one stash on a baby doll crib, anyway?). Sometimes, though, I find larger things to move along. Today, I actually removed two: a lamp we don’t use or like and the baby monitor. That’s right. Eliot is nearly four years old, and we each had an end of a monitor. The hardest cord to sever, I think. To me, this marks a greater step forward than the tiny dinosaur underpants I fold and he puts away. He has been sleeping through the night for more than a year now, since he was nearly three, but I liked having that touch to his space, to hear him breathing heavily or just tossing under his blankets. He didn’t give up having me retrieve him from his bed until this summer, so I also needed a way to hear his “Mama? Mama! MAMA!” before he woke Birdie. Now, though? Almost four. He sleeps all night. He doesn’t require me actually IN his room to fall asleep. He counts down from ten snuggles. And he gets up and stealthily sneaks into our room, past Daddy’s side of the bed, to lay on the floor by my bed or to stare at me until I peek back at him from under my bundle of duvet. He sometimes even comes in, sees us sleeping, and goes back out. No longer can we hear him quietly playing cars or reading books as we drift in and out of early morning sleep, but he has proven himself capable of playing quietly and safely, so I think we’re good. He hated that little red light on the monitor perched on his bed. I dropped it off on the floor, then I stopped turning my end on. If it’s not close enough for his breathing, why bother? So, good night, sweet boy. Time to quit whispering. Time to kiss your doggies good-night and snuggle under your blanket. I’ll hear you in the morning. One of my favorite things about having friends who don’t have kids is that sometimes we end up having sleepovers at our house. Usually it involves a lot of alcohol the night before, although this particular time, it involved quite a bit of wine, but also a ton of amazing food at Mangia, an Italian food event that happens every weekend not far from us. What’s even more fun than the impromptu sleepover is the impromptu lazy day that follows. This is not to say that every minute of our Saturday is washed away by sheer bumming, but we do tend to all lie in, once the children are set up with a video or breakfast, and then we all sit about dazedly gazing at the children, and then eventually we have breakfast. Sometimes followed almost immediately by lunch. Last Friday, we went out for the aforementioned amazing meal. We woke on Saturday, and I made every adult a delicious egg-turkey bacon-cheese English muffin, once I went to the store to procure more English muffins (a trip I could have avoided had I merely checked the garage freezer). While at the store, I also bought more coffee filters, after reading this blog post on The Artful Parent about coffee filter spider webs for Halloween decoration. Birdie really loves her some cutting of coffee filters, and not being certain we had any (I use reusable ones for my daily brew), I figured I’d pick up some more. $1.29 investment that is unlikely to go to waste. She wandered in as the adults wrapped up their meal, and I directed her to the coffee filters. She dove in, pulling out the scissor bin, and setting to making webs that looked remarkably like the snowflakes of last winter. We reread the blog post. The crafty member of our friend-set secured her own pair of scissors, and before long, she and Birdie had the hang of spider webs. Bird got distracted, though, by the idea of ghosts. She turned to stuffing one filter into another and tying up their necks with twist ties, thereby clearing out my stash. I brought a needle and thread to the table and stitched up a ghostie garland. Husband attempted a very detailed spider before he and the crafter’s husband took off to play football in the perfect fall air. Birdie went out for a bit, as well, but drifted back to the table several times over the late morning and early afternoon before she and our friend had covered the kitchen window with decorations. Googly-eyed pipe cleaner spiders, coffee filter spider webs, and a choir of ghosts filled every pane above the dog’s level. While I’m sure that some of this would have happened at some point anyway, I love that it became a family affair, surrounding Birdie with people who love her and love doing things with her. Except Eliot, who was very very busy.